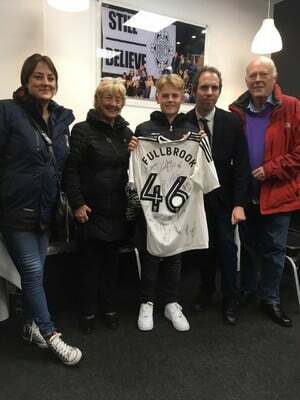 The Fulham Supporters’ Trust celebrated Danny Fullbrook’s immeasurable contribution to football journalism and Fulham Football Club by presenting his family with a signed first-team shirt before last week’s home fixture against Hull City. Lifelong Fulham fan Danny, who lost his brave battle with cancer aged 40 five years ago, was the award-winning football correspodent of the Daily Star and an enthusiastic supporter of the ‘Back to the Cottage’ campaign and the work of the Fulham Supporters’ Trust. He began his journalistic career at the University of Hull and the Hull Daily Mail, which is why the Trust chose last Wednesday night’s game as the best time to present Danny’s son, Edward, his parents, Sylvie and Jim, and sister Jo with a shirt signed by every member of Slavisa Jokanovic’s first-team squad. The Trust’s communications officer Dan Crawford, whose own path into sports journalism was inspired by Danny, said: ‘Danny’s infectious enthusiasm for football and Fulham left a lasting impression on everyone he met. He was a massive supporter of the ‘Back to the Cottage’ campaign and the Fulham Supporters’ Trust and encouraged me as a teenager to pursue a journalistic career. We are very keen to support the work of the Fearless Foundation and ensure that Danny’s legacy will offer more opportunities for young people through sport and sports journalism. We would like to thank Carmelo Mifsud, Mark Maunders, Alistair Mackintosh and Slavisa Jokanovic at Fulham Football Club for arranging at such short notice to provide this shirt to Danny’s family, which shows how specially he is still thought of at Craven Cottage’. The Trust plans to work alongside with Danny’s friends and colleagues at the Football Writers Association and the Fearless Foundation to support further projects designed to a deliver a lasting legacy he will be proud.